NAMED FOR HEISMAN TROPHY WINNER AND FLORIDA GATOR QUARTERBACK TIM TEBOW, THIS HYBRID LOCATED AT THE UNIVERSITY OF FLORIDA TROPICAL RESEARCH AND EDUCATION CENTER IS A REAL CHAMPION. LIKE THE DUAL VIRTUES OF TIM'S RUNNING AND PASSING GAME, THE TEBOW MANGO HAS THE VENERABLE VIRTUES OF BOTH QUALITY AND PRODUCTION. BY CROSSING AN EDWARD WITH A KENT IN 1972, DAVID STURROCK OF WEST PALM BEACH, FLORIDA DEVELOPED A FRUIT THAT HAS THE PRODUCTION QUALITIES OF THE KENT AND THE INCREDIBLE EATING QUALITIES OF THE EDWARD. THE FRUIT WAS ORIGINALLY DUBBED THE YOUNG, AND MOST LIKELY WENT UNNOTICED FOR DECADES SIMPLY BECAUSE OF ITS YELLOW SKIN, WHICH WAS UNDESIRABLE TO COMMERCIAL GROWERS. 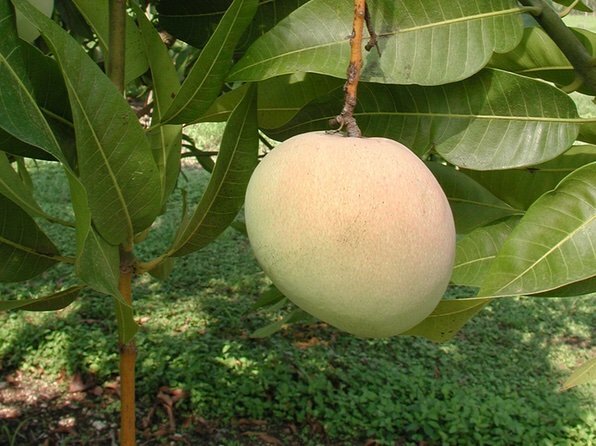 BORN ON A LARGE TREE, THE FRUIT IS YELLOW AND PINK WHEN RIPE, COMPLETELY FIBERLESS, AND WEIGH ABOUT ONE POUND EACH. IT IS A MID- TO LATE-SEASON BEARER RIPENING FROM MID JULY TO AUGUST.